Located in Montego Bay, this beachfront property is next to a golf course and within 1 mi (2 km) of Three Palms Ocean Course, Rose Hall Great House, and Montego Bay Convention Centre. Half Moon Golf Course and White Witch of Rose Hall Golf Course are also within 1 mi (2 km). This Lucea property is on the beach, 7.5 mi (12.1 km) from Tryall Golf Club, and within 20 mi (32 km) of Montego Bay Cruise Ship Terminal and Montego Bay Marine Park. Half Moon Beach and Samuel's Bay National Marine Park are also within 20 mi (32 km). 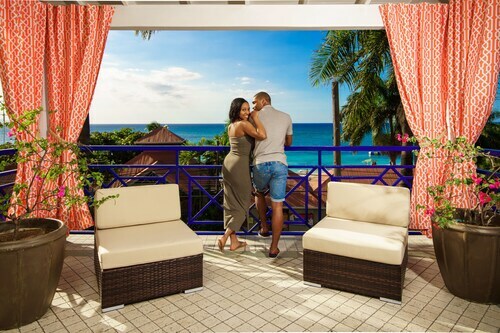 This hotel lies on Montego Bay's Hip Strip stretch of shopping, dining, and nightlife directly across the street from famed Doctor's Cave Beach. 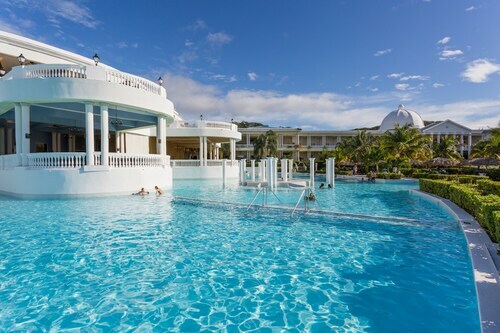 The all-inclusive resort is located 5 minutes from Sangster’s International Airport. Located in Ocho Rios, this beachfront property is in a regional park and within 1 mi (2 km) of Ocho Rios Craft Park, Turtle Beach, and Mahogany Beach. Dolphin Cove and Dunn's River Falls are also within 3 mi (5 km). 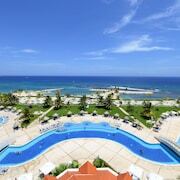 Located on Montego Bay's "Hip Strip," Toby's Resort is one mile from Sangster International Airport. 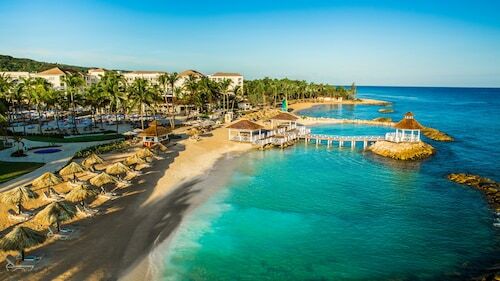 This all-inclusive, family-friendly resort meets a half-mile of private white-sand beach, 16 km (10 mi) from downtown Montego Bay. 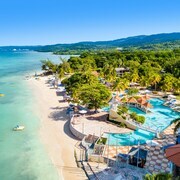 This family-friendly oceanfront resort (6 mi) 10 km from Montego Bay occupies 400 acres of the historic Rose Hall Plantation. Offering direct access to the beach, this Runaway Bay property is 1.2 mi (2 km) from Cardiff Hall Beach and 1.9 mi (3 km) from Green Grotto Caves. Runaway Bay Beach is 1.8 mi (2.8 km) away. 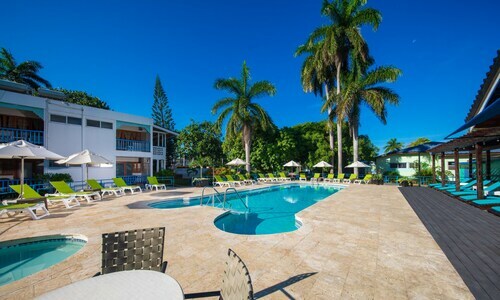 The hotel sits directly across from Rose Hall beach, surrounded by tourist attractions and just 20 kilometers from Montego Bay Airport. Located in Montego Bay, this beachfront property is next to a golf course and within a 15-minute walk of Three Palms Ocean Course and Montego Bay Convention Centre. Rose Hall Great House is 1 mi (1.7 km) away. 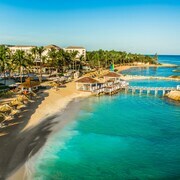 Located in Montego Bay, this beachfront hotel is next to a golf course and within a 15-minute walk of Three Palms Ocean Course and Montego Bay Convention Centre. Rose Hall Great House is 1 mi (1.6 km) away. 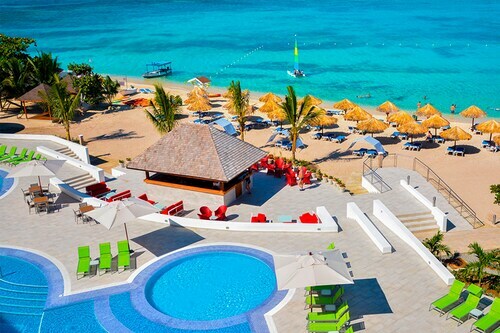 How Much is a Hotel Room in Montego Bay? 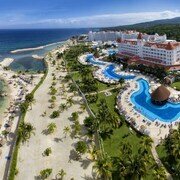 Hotels in Montego Bay start at C$100 per night. Prices and availability subject to change. Additional terms may apply. 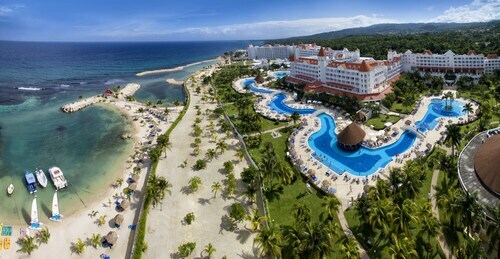 Known as the tourist capital of Jamaica, the town of Montego Bay is a popular cruise destination. 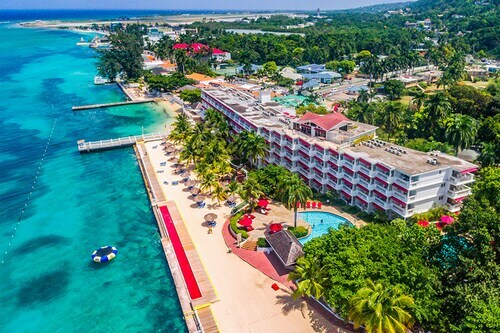 Most hotels in Montego Bay are just steps away from warm turquoise waters, while outdoor reggae festivals and dance-til-dawn entertainment at various clubs keep the party atmosphere lively. 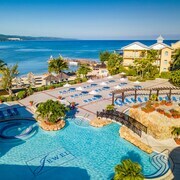 Numerous all-inclusive resorts in Montego Bay dot the breathtaking waterfront, many providing their own private beaches and world-class spas. 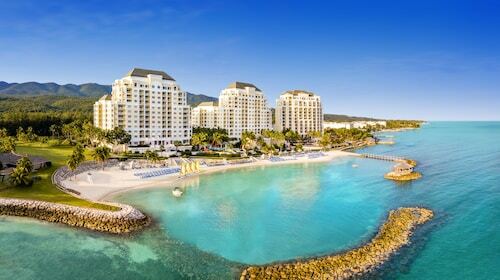 Plenty of options are available for stepping into Montego Bay's crystal clear water and enjoying the colorful sea life and sugar-white sands. Kiteboarding is offered to both newbies and accomplished surfers, while snorkeling and sunbathing are irresistible at Doctor's Cave Beach. To learn about Jamaica's culture and history, take a tour of Croydon Plantation; you'll sample different varieties of pineapple and other fruit, taste fresh coffee, and enjoy an authentic Jamaican lunch. For pure shopping delight, nothing beats the Gloucester Avenue "hip strip," home to some of the best people-watching anywhere. Many cheap hotels in Montego Bay are located directly on Gloucester Street. Walk from your hotel to the Craft Market, then relax at an outside table with a tall drink and watch the world go by. 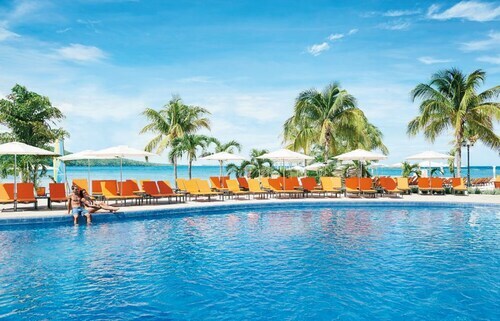 If your cruise ship puts in at Ocho Rios, about 60 miles east of Montego Bay, you can stay at luxury hotels near Coconut Grove Shopping Village. Montego Bay has plenty of places to dine outdoors where you can take in the ocean and indulge in fresh, delicious seafood. Many restaurants will also have authentic Jamaican jerk chicken - a dish cooked by marinating or dry rubbing chicken with jerk spice, which includes pimento and cayenne pepper. After dinner, enjoy a classic island cocktail with some Jamaican rum. 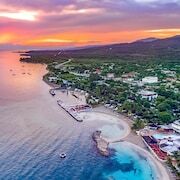 Whether you're looking for Montego Bay hotel deals or a top-rated resort, Travelocity will supply you with all the details you need. It was a beautiful place to stay and the people that work there are so fun and friendly. The property was well organized, lawns were well manicured, pools properly cleaned, the beaches were awesome. Overall the place is great to visit! The resort is giant, but we were always able to get a seat by the pool. This has been such a problem at other resorts. On Saturday, 4/20/19 the hotel lost power and I was forced to sleep in complete darkness. There was no communication about how long the power would be out and it did not return until the next morning. There was no air condition in the rooms and it was very uncomfortable to sleep. The hotel had no back up generator so we were forced to wait until the power returned.